In the past year, public opinion has nearly coalesced around the fact that distracted driving is dangerous and should be eliminated. But what about distracted walking? A new law proposed in New York that would outlaw the use of electronic devices for pedestrians, including runners, has ignited the debate about distractions and whether the government should step in, even to reduce pedestrian accidents. Last spring, I spoke with California state senator Joe Simitian, who had proposed a law that would impose penalties for distracted cyclists. When asked if this type of law could lead to more restrictions, including bans for distracted walking, Simitian said that outcome was unlikely. But Anne Teigen of the National Conference of State Legislatures suggested that the progression was inevitable. “The big thing has been distracted driving, but now it’s moving into other ways technology can distract you, into everyday things,” she told the New York Times. 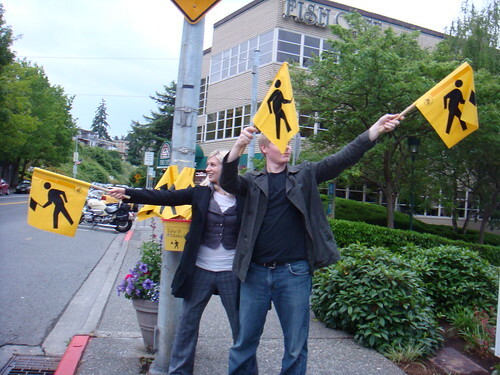 Last week, the Governors Highway Safety Association reported that for the first time in four years, pedestrian accidents increased slightly in 2010 over the year before. “Both drivers and pedestrians are increasingly distracted by cell phones and other portable electronic devices,” the report offered as an explanation. “Anyone who travels in a busy city has seen countless pedestrians engrossed in conversation or listening to music while crossing a busy street,” added GHSA Chairman Vernon Betkey Jr.